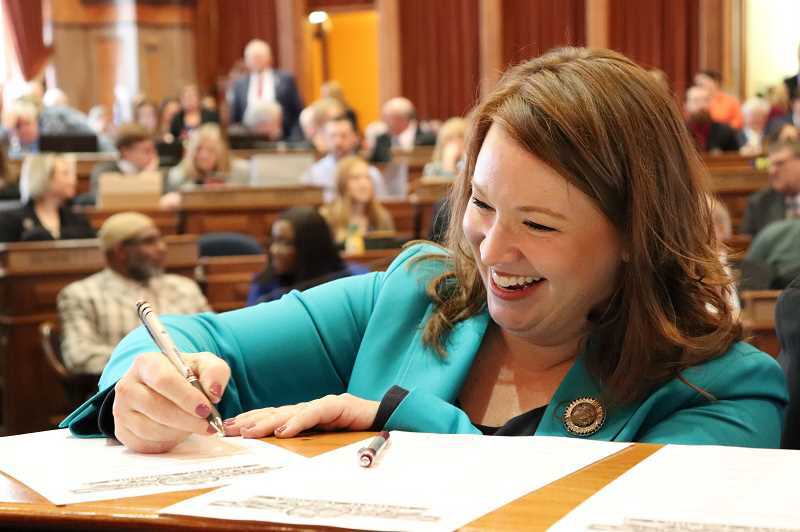 Lindsay James' path to a seat in the Iowa House of Representatives began shortly after election night in 2016. "I'm having a conversation with my then-6-year-old daughter, stumbling through this conversation about our next president," said James, who grew up in West Linn. "I could see her absorbing the information ... and she says, 'Mom, does this mean we have to build a wall?'" 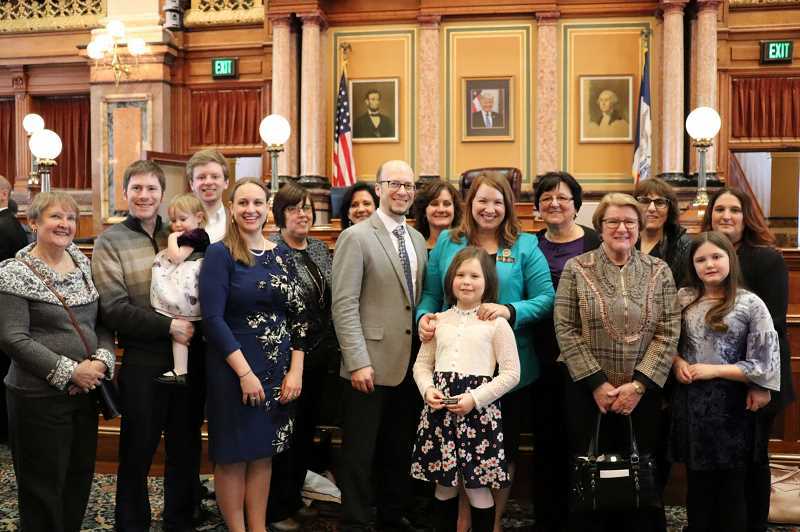 Her daughter's concern mirrored what James — who worked as a college chaplain before joining the Iowa Legislature — was seeing all around her as a political sea change swept the country. A resident of Dubuque, Iowa, James had served on the Dubuque County Extension Council and as chair of the local Community Development Advisory Commission — experience that mattered as she weighed her next move. "I thought, 'You know, I have all this experience ... there are too many walls dividing people,'" James said. "So I thought I would jump in if a seat opened." After winning a heated battle in the Democratic primary, James would coast to a 60-40 win over Republican Paulin Chilton in the November general election. A little over a month after she was sworn in as representative of District 99, James said the experience had been both thrilling and challenging. "It's a steep learning curve — drinking from a fire hose," she said. "(It's been) fast-paced, deeply meaningful and frustrating at the same time." The frustration stems largely from the Democrats' minority status across the state. Like a flipside of Oregon, Iowa has all three of its governing bodies — the governor's seat, the senate and the house — dominated by a Republican majority. "Democrats can be shut out, because we don't have the power," James said. "We are four seats away from actually being able to be the majority in the house, and hope that with 2020 approaching we'll have strong momentum." In the meantime, James will rely on interpersonal and conflict-resolving skills that she first developed in West Linn. A 1999 graduate of West Linn High School, James — who was Lindsay Beals before she got married — was student body president, a homecoming princess and a member of extracurricular clubs ranging from theater to mock trial and tennis. "Even in eighth grade, she was student body president at Athey Creek (Middle School)," James' mother, Nyna Payne, said. "She loved talking in front of people, and now she's got a great audience." "I had an incredible foundation ... in West Linn," James said. "(I had) some incredible opportunities as a student engaging in student government as well as athletics, theater and art — so access to different kinds of programming and opportunities informed a lot of my skills." James' career working as an chaplain on college campuses also helped develop her conflict-resolution skills. "I've worked with very polarized religious groups on college campuses, so Jewish, Christian, Muslim and atheist student groups," she said. "I've gained a skillset there having really difficult, complex conversations with people and helping bring people together across differences." The work is intensive, and takes James away from her young family for four days each week over the course of about four months each year. But, as James put it, "I get to problem-solve all day long" — and she views her service as essential in uncertain times. "It's our human instinct when something is on fire to run away from it," James said. "But if we don't have good people who can run toward it and help put it out, it's going to burn to the ground."